A book of his work. Edited by Carole Devlin and Victoria Kate Simkin. Published 2018 by ACC Art Books. 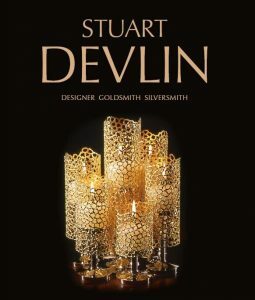 Whilst it may seem a strange thing to say, we have his stroke to thank for the fact that the full range of Stuart Devlin’s work has been presented in this fabulous book. A man with a strong work ethic and endless ideas, he would not have paused to look back unless forced by circumstances to stop drawing. Fortunately, the stroke did not affect him mentally and so for the last three years of his life Stuart was an active contributor with his wife Carole, and her sister Victoria to the design of the book. Stuart wanted the book to be visually engaging and easy to navigate with large pictures and short captions. Carole tells stories of her computer being hooked up to the TV in the kitchen so Stuart could see and comment on the placing and size of photos on each page. His eyesight was impaired after the stroke. Indeed, nature was kind and the book was published and completed a couple of months before Stuart died, so he was able to hold the finished book in his hands and enjoy the ensuing praise of his work and the book. A multi-talented designer, goldsmith, silversmith, sculptor, painter, engineer, furniture and house designer, Stuart was a man who took all the opportunities life offered, and his Harkness Fellowship was no exception. Born in Geelong, Australia, one of four boys, his parents encouraged resourcefulness in their sons as they kept the family going through hard times. His father taught his sons to use a wide range of tools and in addition to Stuart’s design career another brother became a skilled cabinet maker and designer. 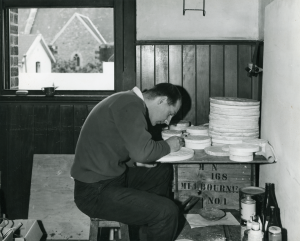 Early lessons in metalwork and geometry at primary school helped him to apply for a scholarship (age 13) to study art and metalwork, leading to becoming an art and design teacher initially in Wangaratta and later at an innovative art school, Prahran Technical school, in Melbourne. 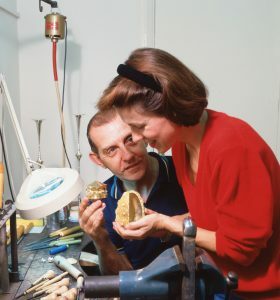 While teaching in Melbourne he gained a Diploma of Art in goldsmithing and silversmithing, taking only one year, part-time, for what was a three-year full time course. His marks were the highest ever awarded, and led to a scholarship for the Royal College of Art in London. Again he completed his course in record time and won a thesis prize. Whilst studying at the RCA in London he heard about the Harkness Fellowships and thought it would be a marvellous opportunity. Carole explains that, unclear about the application process, he found himself invited to a rather grand lunch one day, throughout which he was engaged in intensive conversation by his neighbour. At the end of the meal his dinner companion pronounced that he had been selected for the Fellowship, though Stuart had been unaware this was the interview. 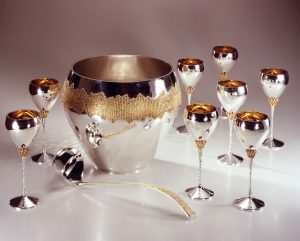 During his first year at Columbia Stuart pursued his silversmithing skills and lectured on the Nature of Creativity. He also visited all the National Parks in a camper van which had been provided for him by the University. For his second year he sought the opportunity to test and develop his sculpting skills, rekindling a child hood hobby. Permission was given as long as he allowed students to come in to view him working and produced an exhibition of his work. 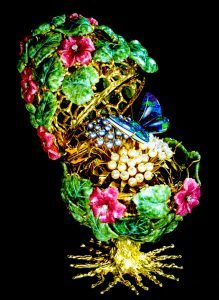 He had to tout his work around a number of galleries until he found one, The Thibaut Gallery on Madison Avenue, that would exhibit his recent work. The show was a success in terms of sales, but, as can happen to a man often ahead of his time, the three published critiques were extremely derogatory about his work. He did not let this deter him. His time as a Harkness Fellow was hugely influential according to Carole, and indeed this period of experimentation stood him in good stead 20 years later, when the 700% rise in the price of silver (the so-called Bunker Hunt crisis) almost destroyed his business. 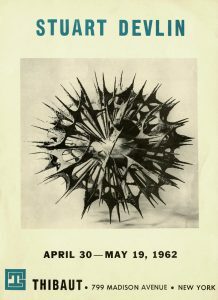 Stuart diverted energy to his other design skills and mounted an exhibition of sculpture “ Homage to the Sphere”. 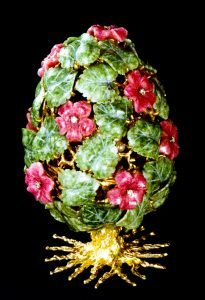 Apart from tiny gold figures they were made from brass, stainless steel and wood. One of the quotes from Stuart in the book is; “You learn more on the way down than you do on the way up”. Stuart made a life long friend of another Harkness Fellow of that era and they met weekly in London for lunch throughout their 50+ years of friendship. At the end of the fellowship, Stuart returned to Australia to complete his teaching contract. Within a year he was recruited to submit proposals for the design of the Australian Decimal Coinage. The youngest of all in contention, he was successful, and this commission brought him to wider public attention. At the same time he decided to make his home in the UK. Stuart taught many people over the years and even after his stroke continued to work with a group of six post-graduate students at the Goldsmiths Institute, which he helped found between 2005 and 2011. He kept his lecture notes, and each section of the book starts with a quote from these. An innovator in all spheres of his life he was willing to take risks not just artistically; for example, for the computerisation of his company accounts, he chose the only one of ten bids that used a revolutionary computer and new software. This was back in the mid-1970s. Equally, and not always associated with innovators, he was systematic in his approach to recording his work; he kept all his design drawings and the photographer next door to his workshop in Clerkenwell took pictures of his work before it left the studio. This was partly as a record, and partly to get press coverage; his skills included PR, though no picture was ever ‘tweaked’. All these photos meant there was a great archive for Carole and Victoria to work from. Never one to let an opportunity go to waste Stuart used his life experiences to inspire designs. An invitation to spend the weekend at the grand Invercauld Castle in Scotland in the lead up to his Harkness Fellowship inspired a set of cutlery based on what he observed as beautiful table manners. The experience was not without its challenges – an impoverished student he had to walk the one mile up the drive with his heavy suitcase and as raw kid from Australia just the number of doorways in the castle felt overwhelming. 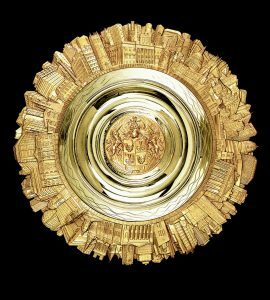 His famous design, a 30-inch charger, commissioned for the Millennium by the Worshipful Company of Goldsmiths, depicts 85 buildings from around his adopted home within the walls of the City of London. This piece of his work is now on permanent display in the Livery Hall of the Company. He was Prime Warden of the Company for the year 1996/97. This book is a wonderful family project – published with deep care and short anecdotes that help the reader appreciate the man as well as his designs. Many Harkness Fellows will find that his quotes resonate with their own experiences of challenge and stimulus during their time as fellows. “A mind that is creative does not stay that way for very long if it is not stimulated by challenge and nourished by acceptance of the ideas generated by that challenge.” or “Stimulus and freedom of thought produce creativity; inhibitions restrict it.” Whether studying design or seeking solutions to the knotty problems of delivering health care, these are wise words. The book, published by ACC Art Books is widely available from book stores and on line. Sources and photographs: Interview with Carole Devlin and Victoria Kate Simkin: The featured book.